Part II: How can we envision solutions to the challenges for life on Titan? Titanoids – terpenoid-like molecules used by life on Titan. They provide the subunits (monomers) necessary to make large molecules (polymers), the way amino acids make proteins on earth. Protiteins – These molecules are build up from the smaller titanoid subunits, and serve the role of proteins for Titan life forms. Genoids – steroid-like molecules that have been naturally selected by life on Titan to store the genetic information, similar to nucleotides on earth. They can “base pair”, based on complementary physical fit with another specific form of genoid. Titanite – life forms found on Titan. Reverse lipid bilayer – a molecular membrane on Titan in the PNAL scheme that has its hydrophobic tail facing the methane solution outside the cell, and its polar head facing the cell interior to remain in contact with the polar solvent concentrated in the cell. In Part I of this article we discussed the special properties of water that makes it so important for life on earth, and the properties of liquid methane on Titan that make it a poor substitute for life as we know it. So while in Part I we focused on what the problems are for Titan biochemistry to exist, Part II will look at some theoretical solutions to those problems. For methane to be the fluid of life, would require life to take on an entirely different character from what we know. Methane’s non-polar physical character presents major hurdles that may prevent interesting biochemistry from taking place in a such a non-polar liquid solvent (NPLS). While liquid methane is abundant on the surface of Titan, and undergoes a methane cycle, similar to the water cycle on Earth, a non-polar solvent for life would seem problematic at best, and impossible at worst. For that reason we will also consider some other options for life on Titan. We’ll look at the possibility of a Polar Non-Aqueous Liquid Solution (PNAL), that might provide a way for Titanites to survive and evolve by creating an internal environment friendly to polar chemical reactions, like those seen in Earthly life forms. As I said in part I of the article, “We will stick, as much as possible, to the rules of organic chemistry, but Warning, wild speculation ahead”. Ready to jump into a lake of liquid methane? Here we go! Lets start with the Non-Polar liquid solution (NPLS) possibilities. If we accept methane as our solvent because it is the liquid that happens to be flowing on Titan’s surface, then we’re faced with a difficult dilemma. 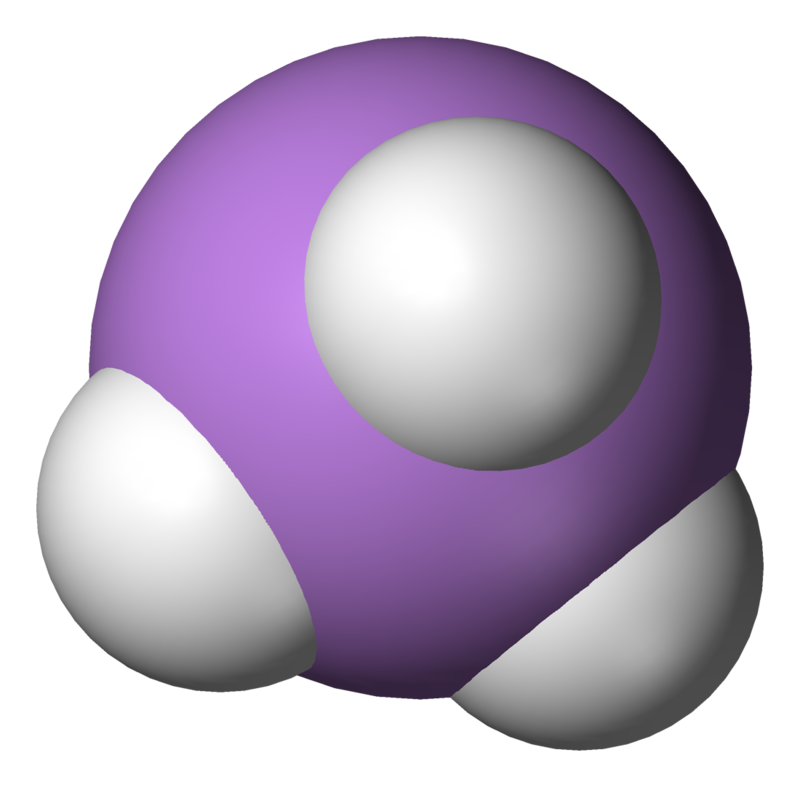 Methane is a non-polar compound. It’s dipole moment is zero, zip, nadda, in other words, it has no permanent charge separation within the molecule itself – unlike water which has a relatively large dipole moment of 1.85 D. So just like the adage, water and oil don’t mix, on Titan we’re dealing with oil so the things that will dissolve in methane are also going to be non-polar substances or hydrophobic. The kinds of biomolecules that make life possible on earth would not do well in that “hateful” environment. In fact, the very thing that makes life interesting on Earth is that the molecules of life are very reactive, have groups of atoms in the molecules themselves, that are polar and therefore reactive with other polar molecules. This provides the basis of most of the biochemistry of Earth life. So on Titan, in the NPLS scenario we would not expect to find things like Earth-like DNA or proteins. So how could it work? We would need non-polar molecules so that they could remain in a methane solution. Due to the extreme cold on Titan, any polar molecules would have too stable of an interaction with each other and precipitate out of solution as a solid. In other words, DNA, and other similar molecules would crystalize out. Not really a very good way for life to get started. On Earth we do have lots of non-polar biomolecules in the form of waxes, oils, and fats. The biochemistry on Titan, in the NPLS would have to be made of something like that. Life also seems to need small building block materials (monomers) that can be polymerized together to make large biomolecules. We need to find non-polar compounds that can, in principle function that way. Two possibilities could be substances similar to terpenoids or steroids. Let’s look at terpenoids first. Terpenoids are a class of lipids that are made out of multiples of 5 carbon units. Their precursor molecule is isopentenyl diphosphate – a 5 carbon compound attached to a diphosphate group. By using this as the basic building block, you can build up a larger sized molecule with the isopentenyl as the basic unit. Since Titan’s oceans are methane with some ethane, we might imagine our basic building block to be a 2 carbon unit – made from the ethane. That way our biomolecules would be large with an even number of carbons because they are built up from multiples of two. Instead of terpenoids, we’ll call these molecules titanoids, and they could perhaps function in the role of amino acids, being used to build larger biomolecules, the equivalent of proteins – we’ll call these protiteins (pronounced Pro-Tie-Teens). There could be different titanoids used – like the 20 different amino acids on Earth – each with a different non-polar side chain. Next lets look at the steroids. These are a diverse class of molecules which all have a basic 4 part ring structure. All steroids are themselves derived from a terpenoid compound called lanosterol. The rings, which are labeled A, B, C, and D, can themselves be altered in many ways to give the wide variety of steroids found in plants and animals. Having a hydrocarbon ring system, like in the steroids found on Earth, produces an essentially non-polar and hydrophobic compound. Like terpenoids, they could mix easily in the liquid methane environment found in the cells of Titan organisms. The rings themselves can be boat-shaped if saturated, but flat if aromatic (meaning they have double bonds like benzene that provide an aromatic resonance). We might imagine the non-polar and very cold environment on Titan to favor a kind of stacking of these rings. They might be produced to fit neatly on top of one in other, so that instead of have a linear molecule composed of many monomers, like Earth protein or DNA, on Titan we might have layers or thick sheets of molecules that are stacked on top of each other, held in place by their Van der Waals forces, to provide the structure. The weak Van der Waals forces would keep the molecules, essentially glued together. This would provide a very different and alien kind of molecular structure than earth organisms which put molecules together with covalent bonding. We also need some type of information storage molecule to allow a Darwinian type of evolution to take place. We might also imagine steroid-like molecules serving the function of information storage that DNA and RNA can serve on earth. There would not be hydrogen bonding between nucleotide bases possible in the cells hydrophobic methane protoplasm. 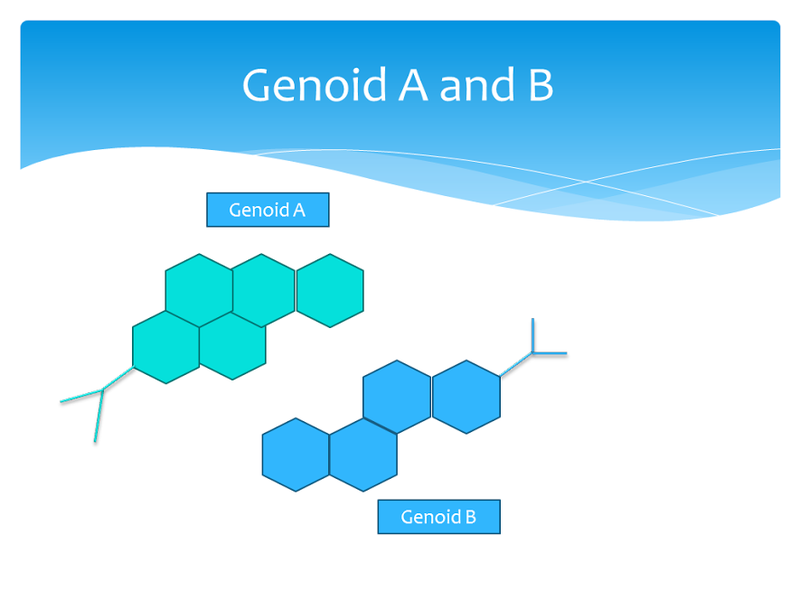 Instead several different steroid types (lets call these genoids to indicate they form the genetic material based on a steroid structure) might have been chosen in which one molecule seems to make a very good physical fit with one of the other chosen genoid molecules – essentially a lock and key type of interaction based on complementary shape. 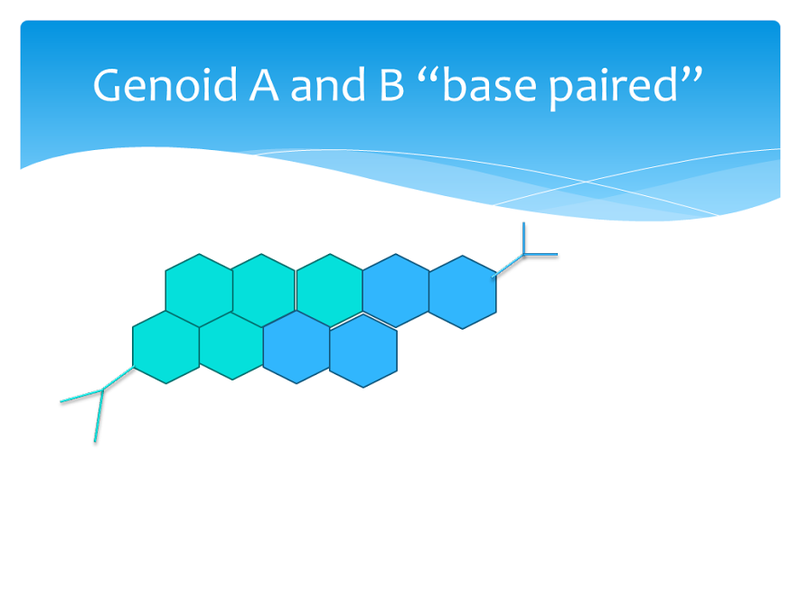 No hydrogen bonding would be necessary, just the close fitting together of genoid 1 with genoid 2, and genoid 3 with genoid 4. That way there is a template for copying the genetic material, and way to store information in the genoid 1, 2, 3, and 4 code. The back side of the genoids might contain functional groups, such a methyl groups, that would create a steric hindrance so that they can only fit together in the desired base-pairing way. There could be only 2 genoids, although that would not allow for much coding information, or there could be more than 4. So for example, a “codon” with the genoid sequence 111, might code for titanoid A, and the codon with genoid sequence 112, might code for titanoid B, and so on. The genoids might stack on top of one another but fit together with their complementary sheet, which forms the template for replication. Because dispersion forces, which are terribly weak, are holding the works together, this would only be possible at the extremely low temperatures, like those found on Titan. If the temperature was raised the molecules would fall apart and the organism would essentially melt away. Even the temperature of dry ice (solid carbon dioxide) with a temperature of -109F, would be hot as hell for our friendly little Titanites. Somehow we would have to have a mechanism that allowed the genoid code to be translated into the titanoids to make some sort of polymer structure. Since hydrophobic chemistry is rather boring – I mean only in the sense of being unvaried, not that it is stuffy in any way – because there is no nucleophilic substitutions or eliminations, or so forth, molecular reactions other than simple dipole-dipole and dispersion interactions, would probably have to take place through radical reactions, using some energy source to produce the free radicals. The PNAL scenario would work by allowing the cells on Titan to essentially evolve to become containers of weakly polar solvent, which keep the polar solvent inside the cell membrane, and the non-polar methane on the outside. There would have to be a way to pump in the polar solvent from the environment and concentrate it in the cell, preventing it from leaking back out. The advantage here is that we then can allow the much more interesting types of chemistry to occur in the cell, with reactions like the nucleophilic substitutions, additions, and eliminations, which can be used to build interesting molecules and metabolize others. This type of life might seem slightly more familiar than the NPLS, that we considered above, but would still be a very alien “life as we don’t know it” variety. We might have to imagine the cell membrane to be a kind of reverse lipid layer, instead of the lipid bilayer found in Earthly cell membranes. The lipid bilayer of Earthly cells has the lipid tails in contact with each other, sandwiched in, while the hydrophilic phosphate heads are facing outward on each side, making contact with the aqueous environment of the interior cell on one side and the water external to the cell on the other side. The reverse lipid layer would have the hydrophobic tail sticking on the outside to interact with the methane environment, but the polar head region (like a phosphate group) on the inside to interact with the polar solvent concentrated in the cell. The solvent here would still need to be an almost non-polar substance with a very low dipole moment. Any truly polar substance – one having a high dipole moment – would have too much molecular interactions with other molecules of its kind, and would solidify at the temperatures found on Titan’s lakes and rivers. Water has a dipole moment of 1.85D, which is way too high for this environment. In fact, water on Titan’s surface forms rock hard geological structures. One substance that might work would be Arsine (AsH3) which has a dipole moment of 0.20. Arsine, with one Arsenic atom and three hydrogen atoms, might conceivably be a substance that could be found or produced on Titan since Arsenic (As) and Hydrogen (H) are both common elements. The freezing point of Arsine is -168.16F, which is pretty cold but Titan is -291.1F, so this would only work if there were some warmer spots on Titan where there is geothermal energy reaching the surface. If true though, Titanites would drink arsenic the way we drink water! The reverse would be equally true, water would be a deadly poison to their delicate machinery of life. 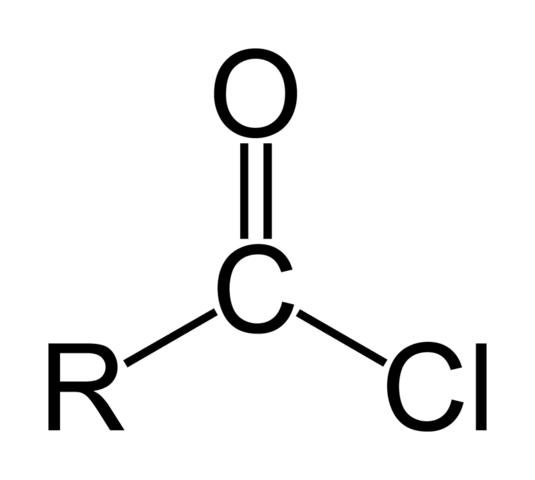 Perhaps a better choice of polar solvent would be Perchloryl fluoride, with a dipole moment of only 0.023D and a freezing point of -234F. This is still a little short of the -291.1F of Titans Lakes, but fairly close so perhaps there could be some “hot spots” where the temperature is a balmy -234F, and the perchloryl fluoride would flow free! Perchloryl fluoride is a molecule made of one chloride, one fluoride, and three oxygen atoms, so it may be something that life on Titan could find or produce and concentrate in their cells. The low dipole moment might still mean that other polar molecules would not react well with it, and there would be the risk of other polar biomolecules freezing out of solution. Getting caught in a slightly cooler zone for PNALs would spell disaster for these little Titan cells, as they would crystalize, whereas the NPLS would seem well suited for the extreme cold of a world far from it’s star. Since the temperatures are so cold we might also need to consider molecules that are extremely reactive – even too reactive for Earth life. We might consider acid halides in place of the usual functional groups like carboxylic acids, alcohols, esters, and so on. 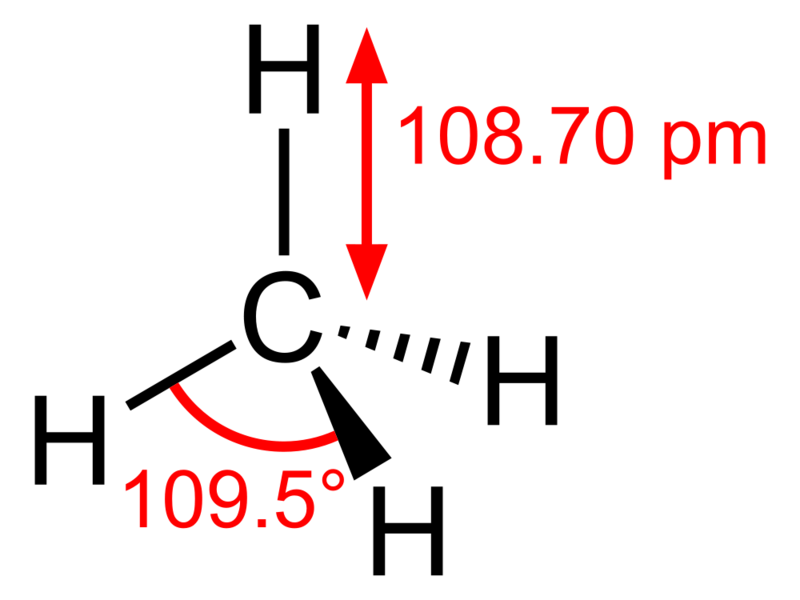 On earth acid halides are too reactive – the halide (such as chloride) would be too good of a leaving group – and they would therefore have no stability. On Titan, however, where the temperatures are so cold the acid halides, like acid chloride for example, might be longer lived so that they might have more stability and could be controlled by cellular process to take part in chemical reactions at the appropriate times. Whether any of this could really play out on Titan or a similar world, I don’t know. This is the fun of pure arm-chair astrobiology. Perhaps some of these ideas could be tested to some degree in the lab. Our only real way of knowing if Titan could support some form of life is to send robotic probes that can go there and conduct the right experiments. I sure hope that a mission like that will happen sometime in our lifetimes. Certainly finding life as we don’t know it would increase our understanding about what life is, and would ultimately mean that life must be very common in the universe if it can manage to find ways to exist on worlds as different as Earth and Titan. In this case it would presumably be water dependent but not based on carbon. 6. See Part I of this article. 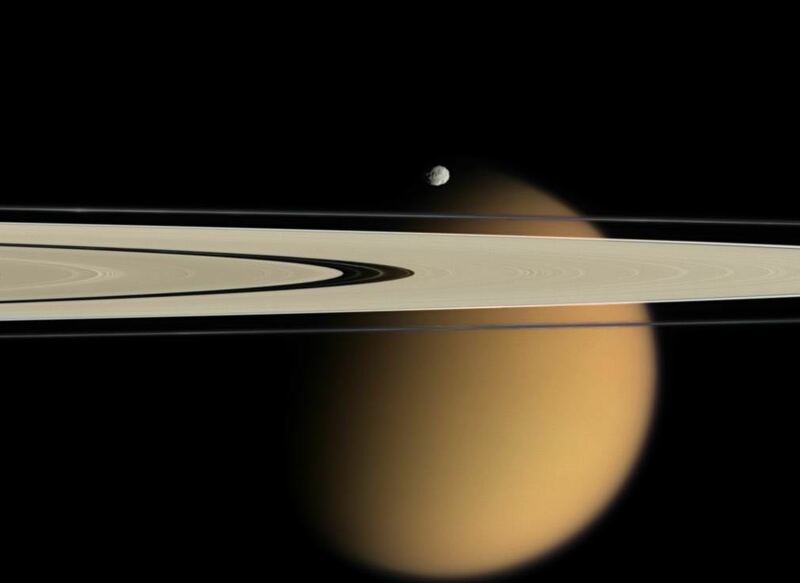 “Musings on the Biochemistry of Saturn’s moon Titan, Part I”. 7. McLendon, Christopher, et al. “Solubility of Polyethers in Hydrocarbons at Low Temperatures. A model for Potential Genetic Backbones on Warm Titans”. Astrobiology, Volume 15, Number 3, 2015. Nice post, how interesting and informative! keep posting! Check my blog, maybe you will enjoyed it as well as I enjoyed yours https://thebeautyofspace.wordpress.com/ Cheers. Thanks, I like your “the beauty of space” blog, as well.